Here’s the thing. 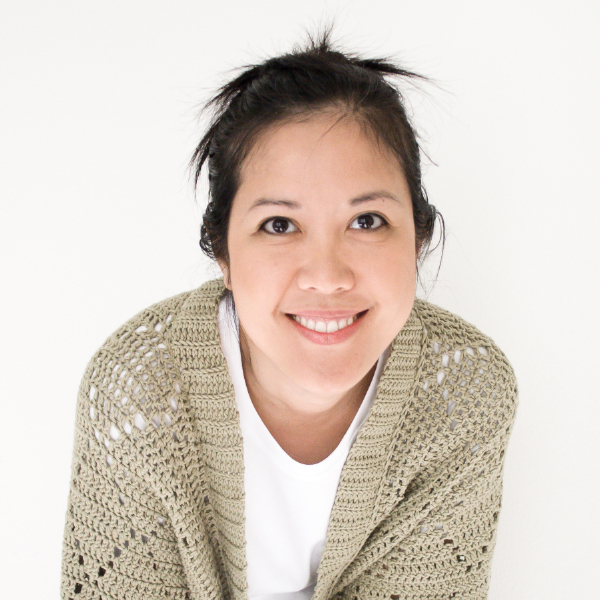 I enjoy the fall – the crisp air, the apple-picking, the pumpkins and the colorful leaves. However, I do NOT like the vampires, zombies, and rated R scariness. I HATE horror movies, so I just can’t do the dark side of Halloween. No spiders, no bugs or bats and only cute friendly witches please. 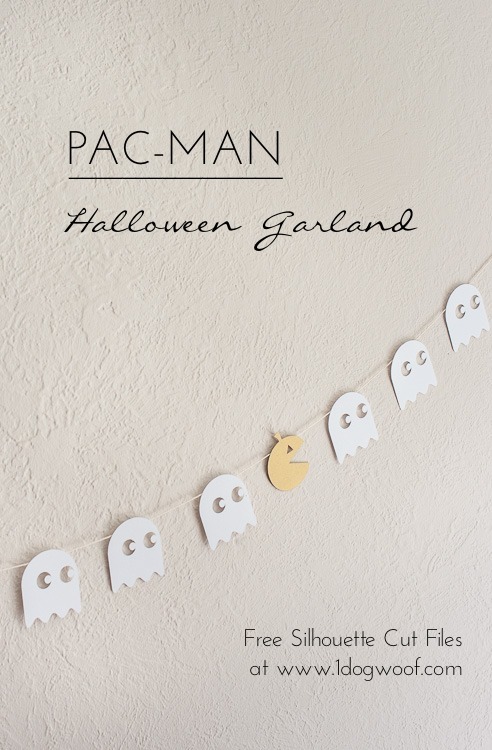 So my Halloween decor is on the fun and friendly side, like this Pacman Halloween garland. 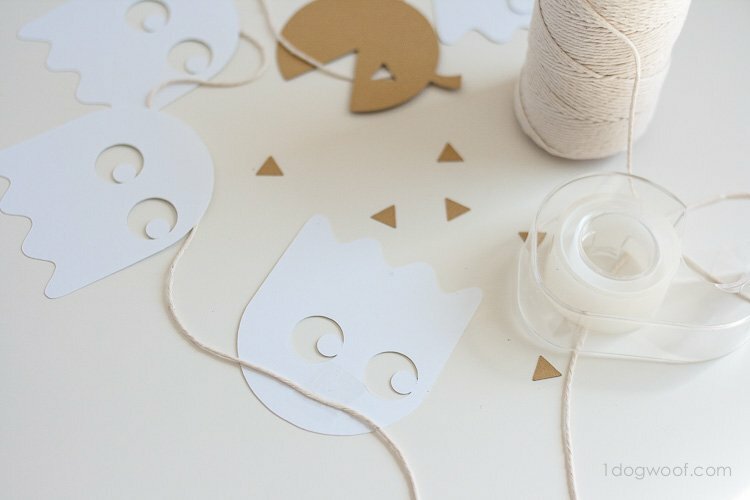 I was inspired by Mini-eco’s garland, but designed my own using my Silhouette Cameo* and I’m here to share some cut files with you. Can I hear a woo-hoo?! See, pac-man ghosts I can deal with. Big eyes and a fun round shape. I’m cool with that. And Mr. Pac-man himself? I popped a pumpkin stem on his head and gave him jack-o-lantern eyes to fit the occasion. 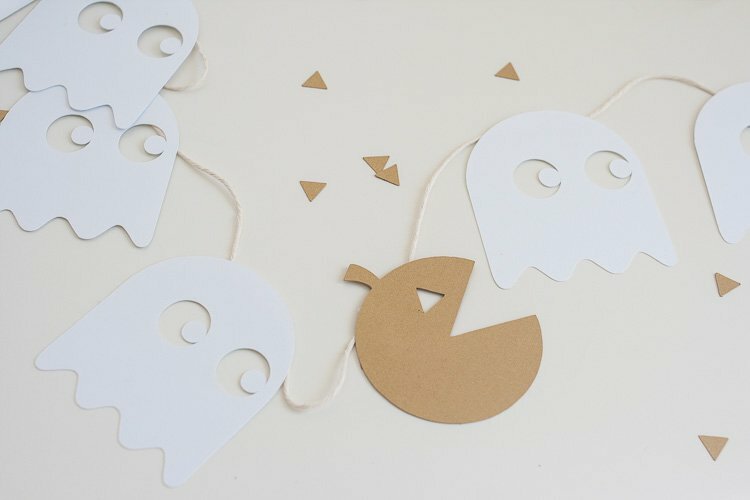 I used white cardstock for the ghosts and gold metallic for the pumpkin pacman. 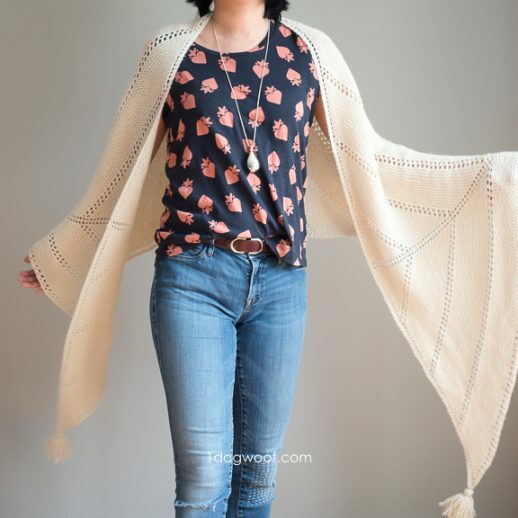 I say this is a super easy and quick craft to put together, but that’s really if you have a Silhouette Cameo to do all the heavy cutting for you. If you had to cut these babies out by hand, it might be something you want to do with a movie and a glass of wine. Maybe drink the wine towards the end, so the scissor hand doesn’t start shaking… HOWEVER, if you DO have a Silhouette Cameo, well then. 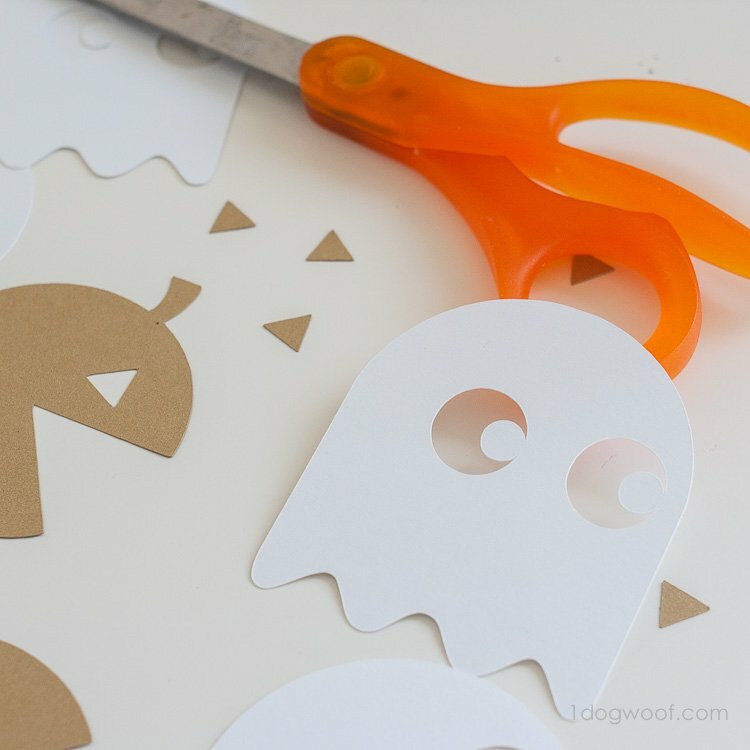 A few sheets of cardstock, maybe 5 minutes, a little bam bam bam with string and tape and you’ve got yourself some cute Halloween decor! 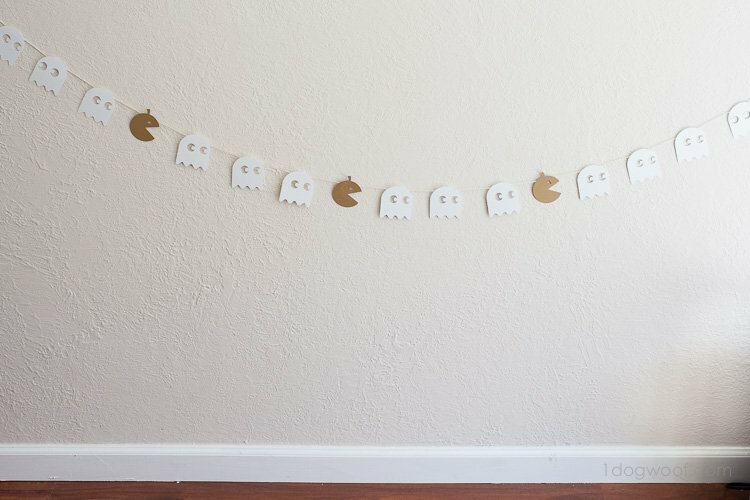 I had one pumpkin pac-man chasing 3 ghosts, and turned the occasional ghost so that he was looking the other way. Ehh, whatever floats your story-telling boat. Ah yes, the part you’ve been waiting for. Here’s a little something for everyone, so you don’t egg my house – the PAC-MAN Halloween templates in PDF, SVG and .studio. Reminder: These cut files are for your personal use only. Please do not redistribute them for commercial purposes. What do you think? Isn’t it the cutest thing? 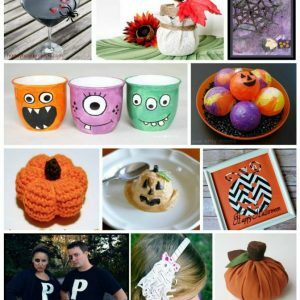 What type of Halloween do you celebrate, if you celebrate? Scary or fun? Blood and gore or cute and friendly? How cool. I love Pac Man! 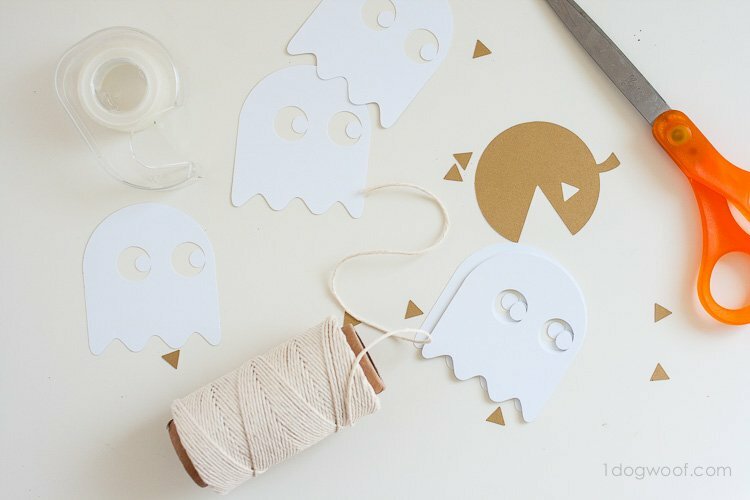 Oh my gosh this is the cutest most creative Halloween garland ever!! LOVE IT. I cannot do the dark side of Halloween ever. No horror movies, haunted houses, creepy decor, can’t do any of that. Thank you Amy! I’m with you, no scary anything for me. I absolutely refuse to go on haunted hay rides, and can barely make it through the Haunted Mansion at Disney, lol! This just made me squeal with delight! LOVE it. Doesn’t match my scary, glam vibe at home, but it is going up in my office as soon as can. Ooh, the office would be a great place for a garland like this! Neutral colors so it’s not too spooky! 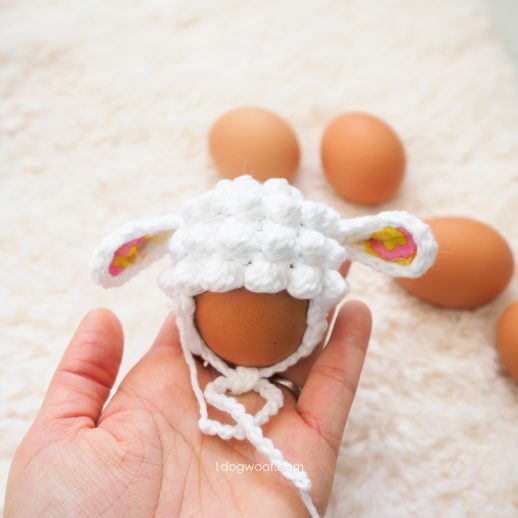 What a CLEVER, creative idea! I’d expect nothing less from you, my dear. Thanks for the free cut file! This is so much fun! I love it! Haha, this is so cute! 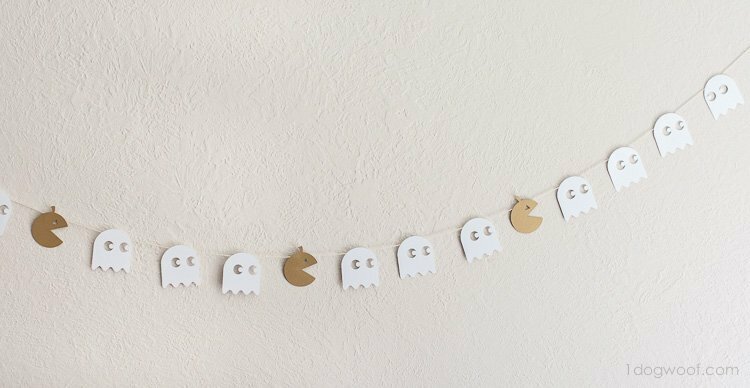 I’m not into Halloween decor so this garland is the perfect middle ground. I LOVE this, ChiWei! It’s so awesome. I’m definitely trying this with my Cameo. hahahaha!!! I love this garland!! 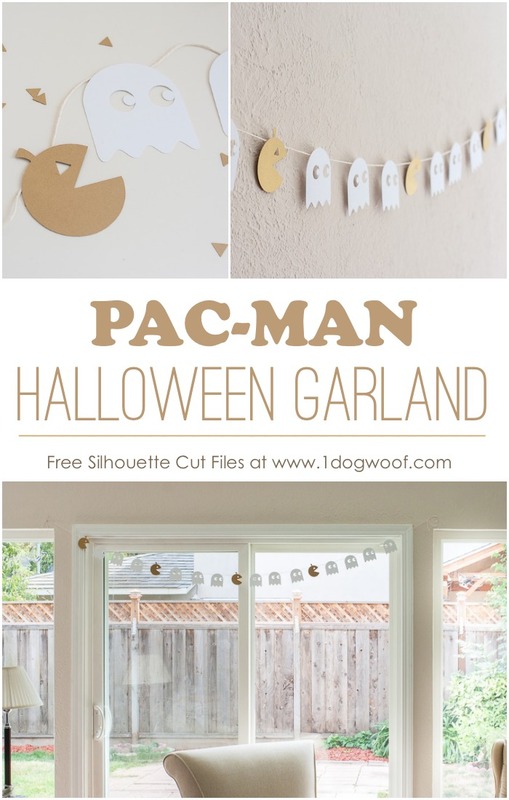 Pacman for halloween decorating couldn’t be better! I’m with ya, I hate all the scary and gory stuff. YUCK. My least favorite holiday. I do, however, love your PacMan banner. So vintage and old school…good memories! This banner is so cute! You are so clever, ChiWei! Oh my giddy aunt, that’s fab! Even without a silhouette I can make this (just might take a little longer I fear!) 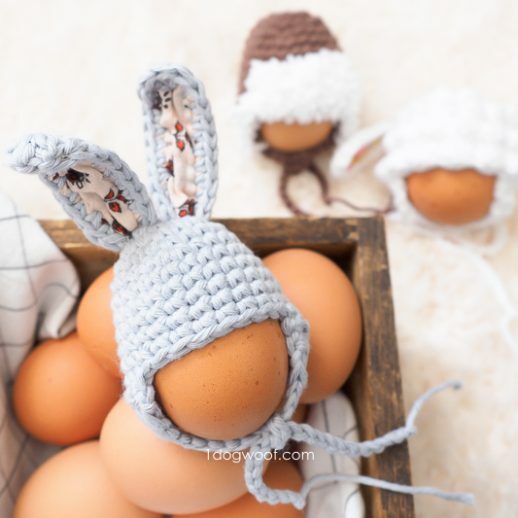 I must make this, I will make this!!! You crack me up! Have fun with it, and yes, it shouldn’t be too hard with a pair of scissors and maybe an exacto knife for the eyes. I like this! Very cute idea! My kids love Pacman and sure they’ll enjoy making these. Nothing better than having your kids involved in home decors. They’re even in my kitchen lab! 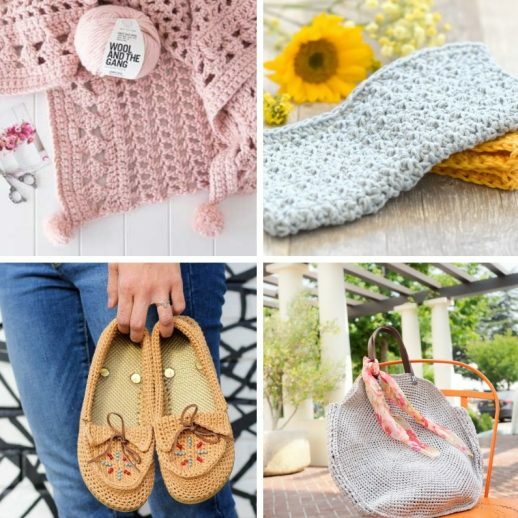 Thanks so much for the feature! Yes, I didn’t always have a cutting machine, so I know how it feels! Awesome! I think I may have a crafty crush on you! Awww, thanks! Have a great one! What a cute idea!! Thank you for sharing the tutorial! This is a nice chance to tell my kid about Pacman and their Mom’s childhood.